The AC/DC Rockware Grab Bag includes up to 4 randomly selected AC/DC apparel items of the selected size. Number of items included is based on the overall value of the selected goods. Had a go at the 4 t-shirt grab bag and scored a hooded jacket from the Rock or bust tour. Cool. 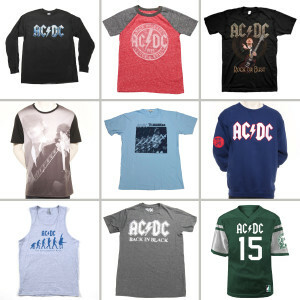 Being an avid AC/DC fan , l took a chance and ordered the T shirt Grab Bag . Since l own about 20 from your AC/DC Official Store, l was thrilled to receive 4 shirts l did not own yet. ALL GREAT ones !!!!!! l highly recommend this Grab Bag. THANKS AND ROCK ON !!!! !